Professionally decorated condo at Seascape -4th floor (with an elevator) has plenty of seating on the balcony so you can enjoy your morning coffee on the glider as you watch the boats go by, or have dinner on our balcony dining set. The living room, master bedroom and the guest bedroom all have lake views. Enjoy music inside and out with our surround sound stereo system. 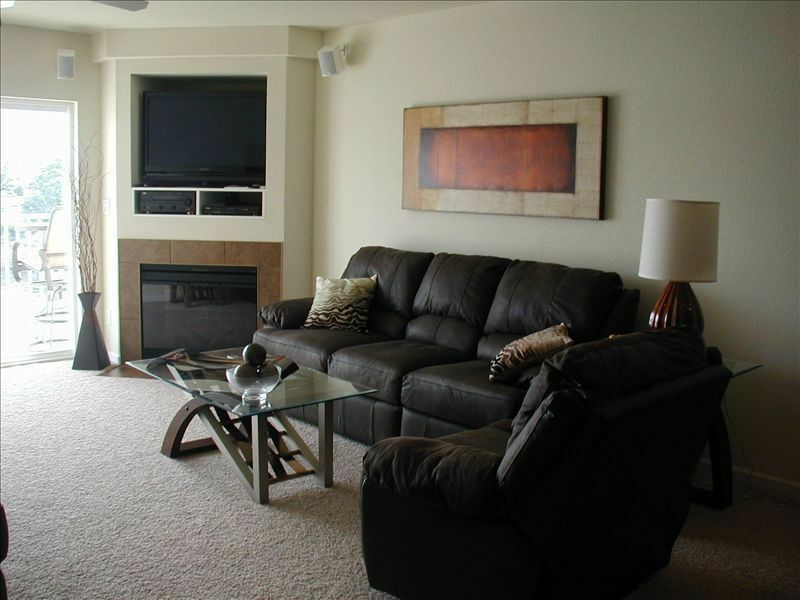 Sit back and relax in our reclining leather sofa and love seat while watching a plasma screen TV. Fall asleep watching the TV in the master bedroom and wake up watching the boats pass by in the main channel. The dining table seats 8 in the kitchen. Boating, golfing and shopping, there is something for everyone. Enjoy the smoke free/pet free atmosphere of our home away from home. We also have a rental boat slip. Quiet, private and a fabulous view. 3 full Bedrooms two with attached bathrooms and the third has a bathroom across the hall. Overlooking the main channel at mile marker 20. Seating for 10 is available on our balcony,6 can sit comfortably at the bar height dining table and 4 can be seated in our pit group. We stayed in the condo for six nights with family. We normally live on our boat nearby but needed the extra space. It was very well decorated and was stocked as well as any condo I have rented. Very nice grill accommodated six adults and the washer and dryer in the unit more than met our expectations. Good location near the Grand Glaize bridge and State Park. Three bedrooms with at least a queen bed was very nice. The master bedroom was great and significantly larger than the other two rooms so this unit would be perfect for a family. Very large deck with a nice main channel view and perfect location for sunsets while enjoying your beverage of choice. The pool was very similar to other condo complexes we have stayed in. This condo is absolutely spotless and like new inside. Plenty of space, very comfortable beds and lovely decorating. The kitchen is very well equipped and having a washer and dryer in the unit was very nice. We had young children with us and they loved going to the pool and fishing off the dock. The deck is enormous with plenty of places to sit. The owners were wonderful to deal with and answered all of our questions. I truly can't say enough about our experience! We will definitely book with Roger and Bonnie again! My husband and I spent a long weekend here and couldn't have been happier. Everything about this condo screams luxury from the furnishings to the location. A beautiful view of the lake adds to the ambience. This place is spotless, well maintained and spectacular in our book. What a treat to find such an oasis at the lake. We will be back. GIRLS WEEKEND AWAY, 8 girls spent the weekend at the condo,it was New,beautiful ,clean,a great view,close to shopping. We took food and drink everything else was supplied. HAD A GREAT TIME!! Highly recommended ! My wife and I stayed for three nights in July 2008. The property is immaculate, very clean and comfortable. We particularly enjoyed the large deck overlooking the lake, a great place to sit back and relax. Bridal Cave, Aracades, minature golf, go cart tracks, City Grill with the Blue Room which offers entertainment, comedy and bands. 10.275% tax is also due. Quiet time is 11 p.m. to 7 a.m. No bachelor parties.